When will she pass me for the first time? 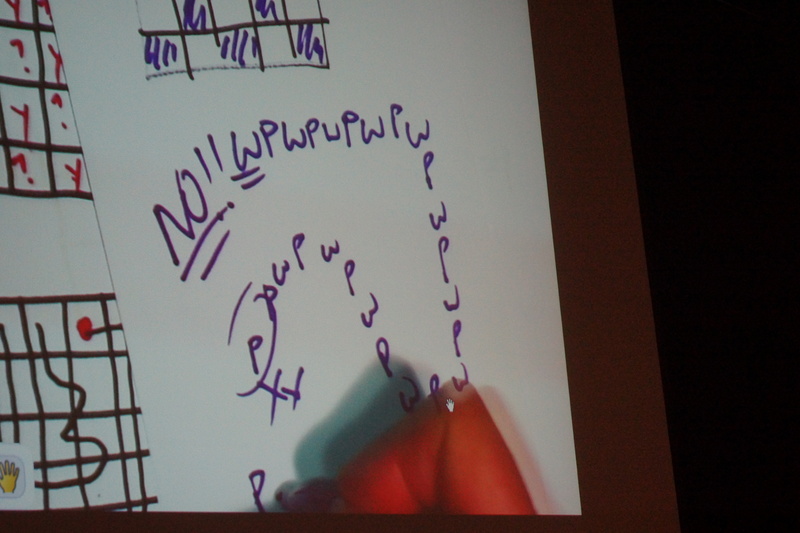 Example: For m = 4, and n = 3, she will catch up when I have finished 3 laps. Reason: When I have finished 1 lap, she finished 1 1/3 laps, so she is 1/3 of the track ahead of me. (But hasn’t passed me yet.) When I have finished 2 laps, she has finished 2 2/3 laps around the track, still ahead of me. When I finish 3 laps, she has finished 3 3/3 laps, which is to say 4 laps. So we are together for the first time since starting. If m = 2, n = 1, she will catch up in just 1 lap. If m = 7, n = 6, she will catch up in 6 laps. Will she always catch up in n laps? In how many laps will she catch up for arbitrary m and n? 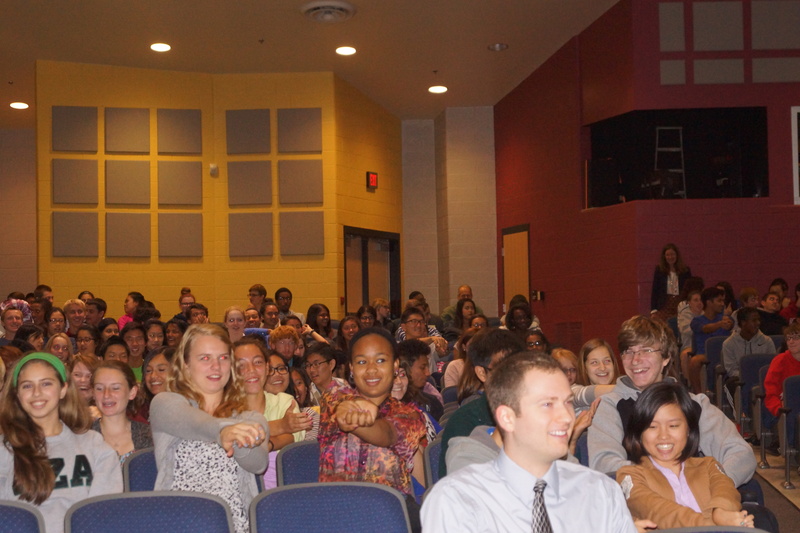 A math pep rally is how my administrator described it. So true! 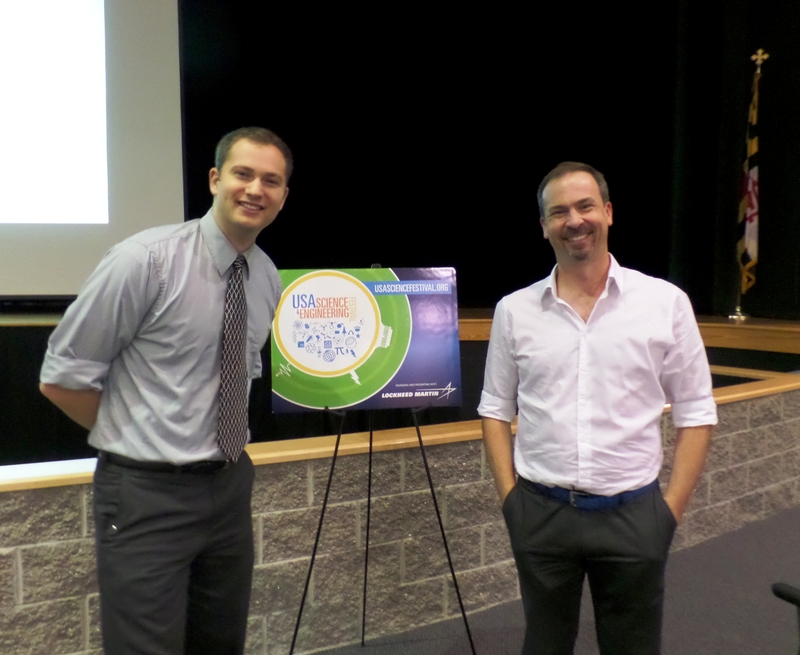 We had a blast hosting Dr. James Tanton yesterday. (Thanks to the USA Science and Engineering Festival and its sponsors for making it possible!) 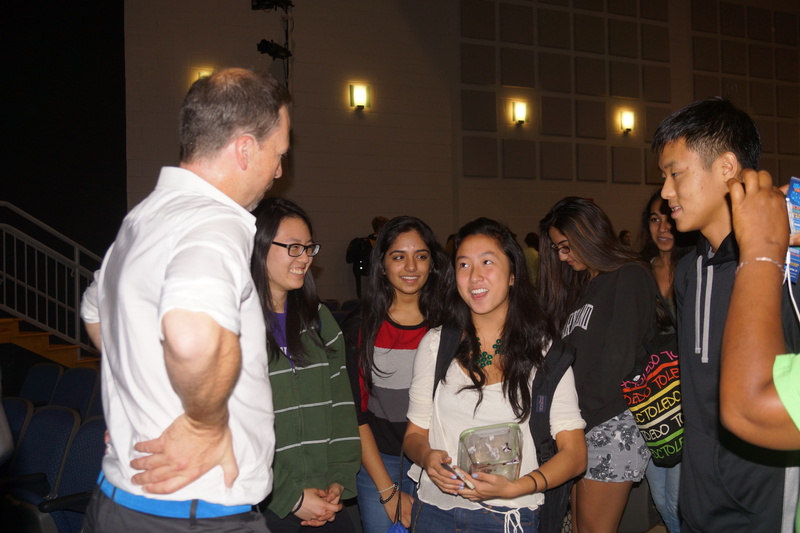 This was certainly the very first “math assembly” in the history of Richard Montgomery High School! 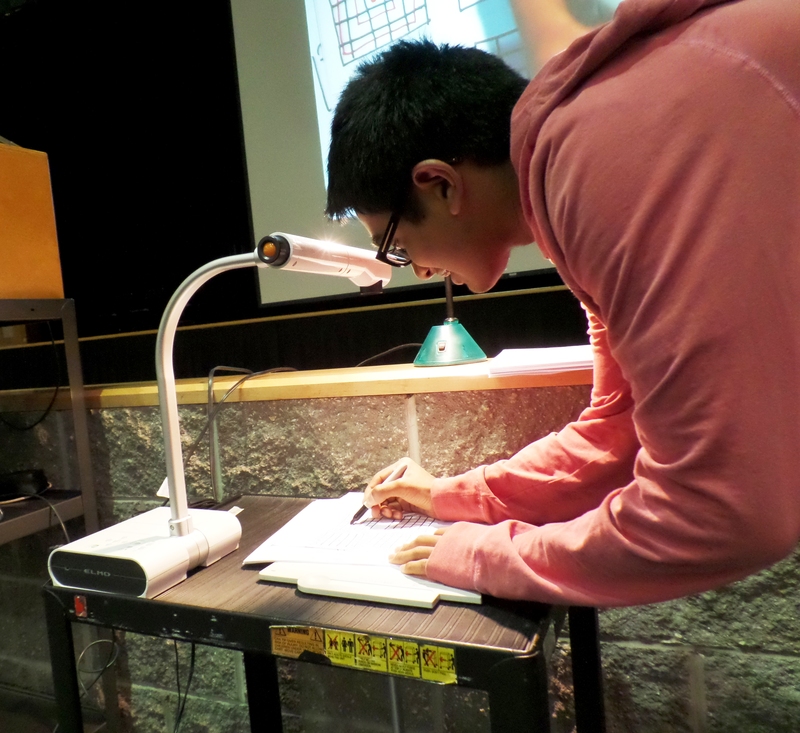 James is a bold man, facing a crowd of 800+ teenagers with only a pen and paper. But his charismatic style was captivating. The kids loved it and I’ve been hearing only good things from all my students. 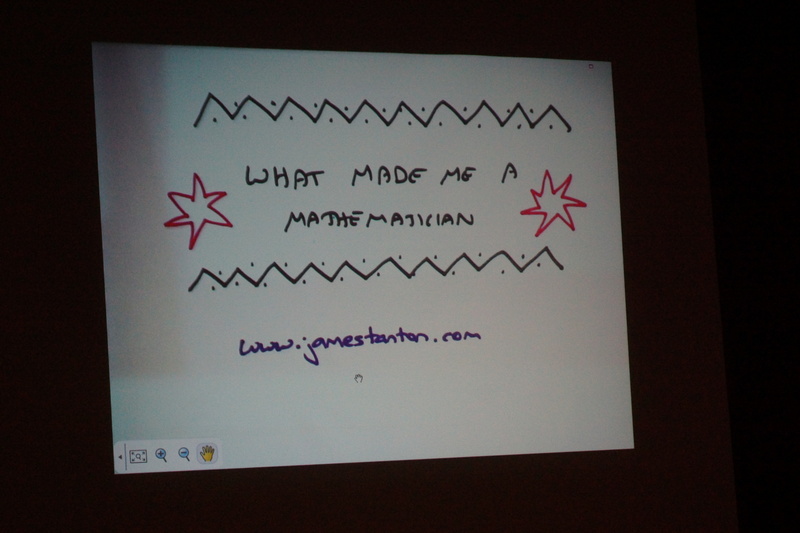 James talked about his own love for math and how he became a mathematician. He talked about how he was asking mathematical questions long before he ever actually declared himself a mathematician. He taught the whole crowd the national math salute and, right from the start, he had us entertained! When he was a kid, James would lie in bed and look up at the tiles in his bedroom and create little mathematical puzzles for himself. 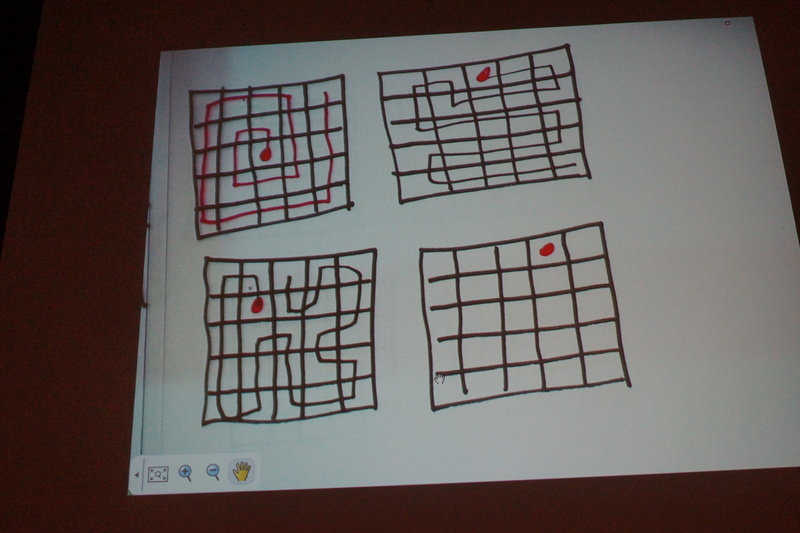 He challenged us to solve his puzzles too, and invited a few students up to try their hand at it. We proved an interesting result with James, and unlike most of my proofs, he got a huge round of applause from hundreds of teenagers :-). James gave our students a real sense of what it’s like to be a mathematician and do mathematical research–it’s a lot like playing! 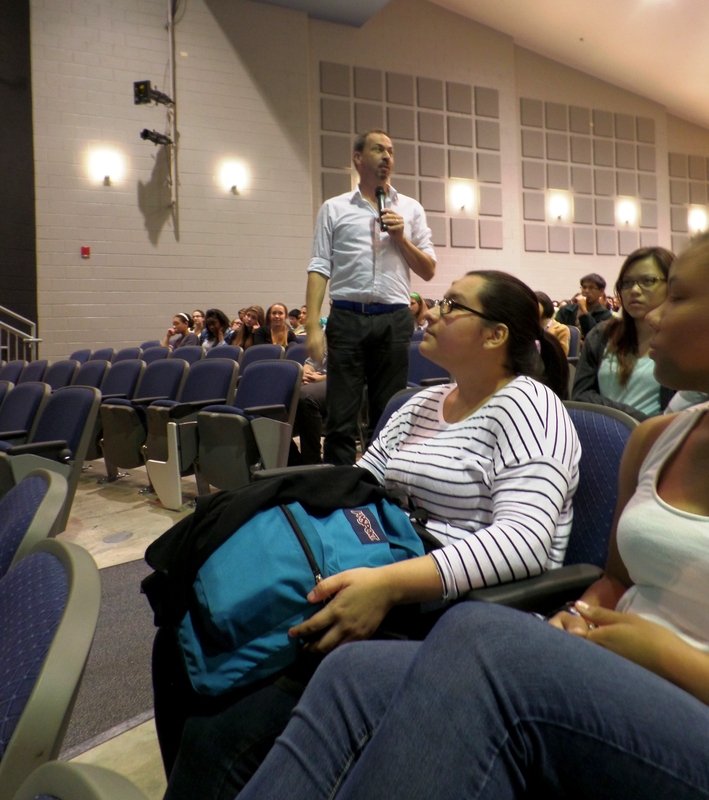 He had the students’ complete attention throughout the assembly and kept them very interested as he walked them through some fun problems and encouraged audience participation. They clapped and cheered for him. Like I said, math pep rally! 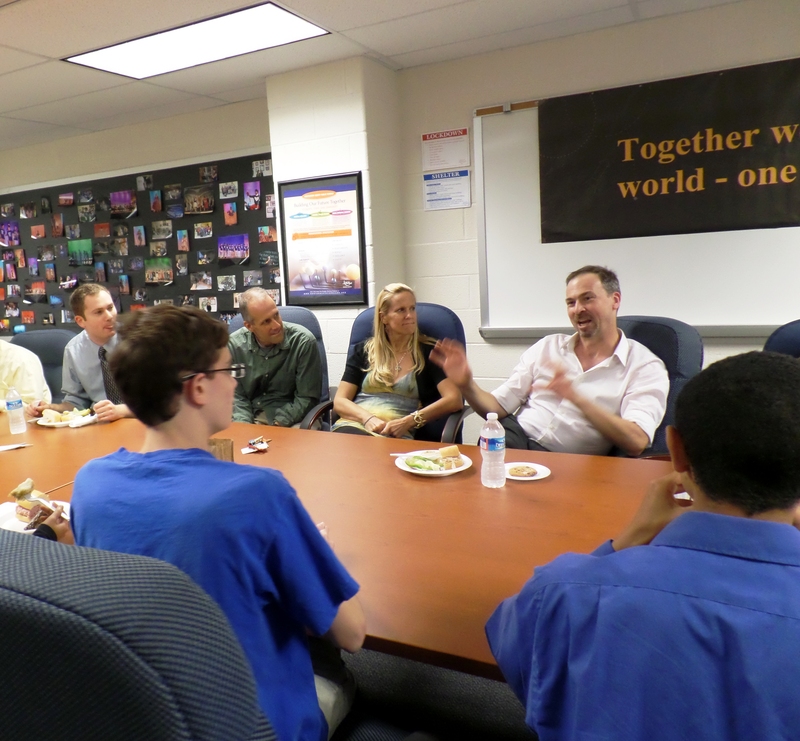 Afterward, some of the students and some math teachers had lunch with James. James got peppered with some more questions. Did you know his Erdős number is 3? Pretty awesome! Thank you, James Tanton, for an awesome assembly! Two jars contain an equal volume of soda. One contains Sprite, the other Coca Cola. You take a small amount of Coca Cola from the Coca Cola jar and add it to the Sprite jar. After uniformly mixing this concoction, you take a small amount out and put it back in the Coca Cola jar, restoring both jars to their original volumes. After having done this, is there more Coca Cola in the Sprite jar or more Sprite in the Coca Cola jar? Or, are they equally contaminated? I have had the worked out solution for a while, just haven’t posted it until now. I’m relatively new with , but I’ve typed up the solution here, if you want all the gory details :-). And yes, Peekay, you got the right answer! I posted the following problem back on December 3. I thought I’d post the solution, but then I decided maybe to just give you a hint. I’ve emboldened each true statement. The other statement in each pair is false. I did a lot of trial and error, making lists of numbers and crossing things off, narrowing it down. I didn’t have a great strategy, so see if you can do better. Can you figure out the number now? 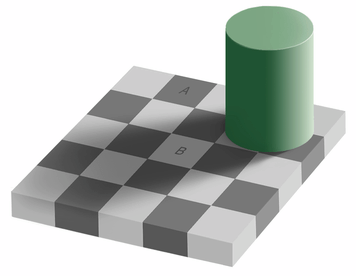 Which square is darker, A, or B?